There is a lot of myths and misunderstandings about what Attachment Parenting is and how it works – usually from people who haven’t really looked into what Attachment Parenting is or how it works. Many years ago I was seeing a psychologist who gave me a very firm lecture on how bad Attachment Parenting is. She believed that Attachment Parenting was harmful to MY mental health and created inappropriately dependent children. Let’s just say I didn’t go back to see her after that! I’ve heard many similar concerns expressed about Attachment Parenting over the years, and I’m not going to say that I’m the ultimate expert, however it is more or less how we’ve raised our children for the last 7 years, so I thought I might just help shed some light on what is – and isn’t – Attachment Parenting. You don’t have to be “Attached” all the time. Just sometimes it helps. The “attachment” part of “Attachment Parenting” refers to the attachment theory; not being literally, physically, attached at all times. Which seems overwhelming or suffocating – the idea of basically never being able to have even one moment to yourself. You can put your baby down or hand them to another person! THAT BEING SAID… being responsive to your baby’s needs could mean that they do spend most of their early months in your arms. Some (most) babies don’t like being left alone, but if your baby is happy to wiggle on a mat or fall asleep by themselves in their cot – that’s perfect! Let’s be clear – it’s Attachment PARENTING, not Attachment MOTHERING. Dad’s absolutely should be an equal part of a parenting team – regardless of the approach you’re both taking. The only thing dads can’t do is breastfeeding – but breastfeeding is not even a requirement of Attachment Parenting. Essentially you’re just responding to your baby’s needs, and the tools that Attachment Parenting often involves – like cosleeping, babywearing, bonding immediately after birth – all can be done by dads. Even two dads can still AP. Myth 3. Attachment Parenting Is A Strict Set Of Rules. Dr Sears who coined the term “Attachment Parenting” suggests “7 Attachment Tools: The Baby Bs”. Note: There are Tools. Not Rules. Think of them as tools you have up your sleeve that you may be able to use to help foster a safe, secure, loving attachment with your baby. Use what works for you and your family. They are: Birth Bonding, Breastfeeding, Babywearing, Bedding close to baby, Belief in your baby’s cry, Beware of baby trainers and Balance. 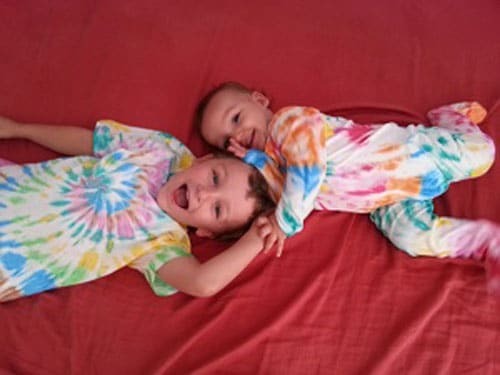 I swear I only tie-dyed their clothes ONCE! 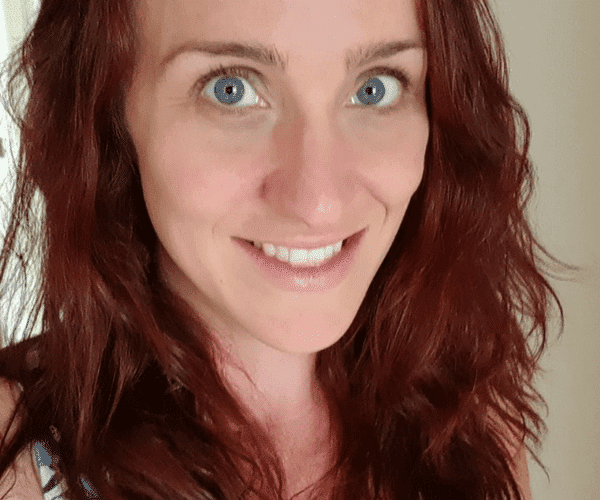 Okay, being honest – I attended an Attachment Parenting Playgroup and yes, many of the parents more-or-less fit into those kinds of stereotypes. 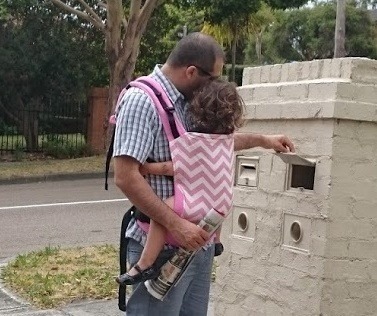 There were a number of parents who had strong opinions about modern medicine, traditional schooling and food… but… plenty of people who use Attachment Parenting vaccinate their kids, eat Maccas and send their kids off to public school. I know I do. Refer back to the “tools”, and you’ll see none of them have anything to do with other lifestyle choices. Myth 5. Attachment Parenting means No Discipline or Boundaries. So, as your baby get older you continue to respond respectfully and trust them, but it does get a little more complicated. For example – your 3 year old might throw a tantrum in the supermarket because they want a chocolate bar. You still trust that they’re crying for a reason, and you still respect that they are a little person who is very upset about something that is very real to them. HOWEVER – this does not mean giving them everything they want. You empathise with how they’re feeling… this can be really hard. There are so many alternatives to punishment or shaming based ways to discipline your child though. Attachment Parenting International have some great ideas for “Positive Discipline”. Myth 6. Attachment Parenting or “Baby/child-led” parenting puts too much focus on babies/children. This is a concern I know a lot of people have. They see demand feeding, babywearing, bedsharing, and baby-led weaning/routines/toileting etc as a way of raising a child who thinks the whole world revolves around them. I think that Attachment Parenting has the potential to do the complete opposite – if you break down exactly what all these things mean and how they compare to more “mainstream” parenting choices. For example; Demanding feeding and not having a set routines means not having to watch the clock or revolve family life around baby’s set feed and sleep times. 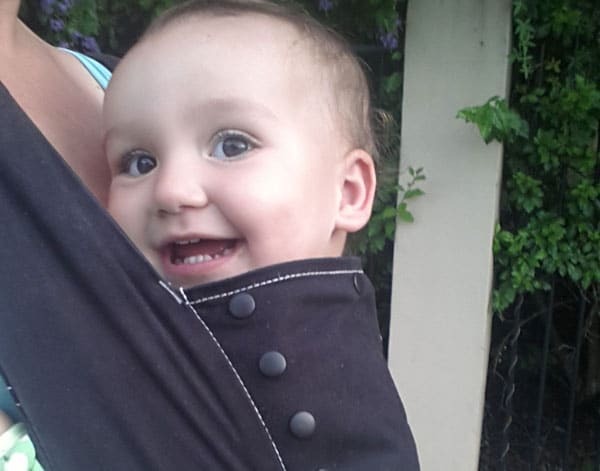 Babywearing basically means you can pop your baby in a carrier and forget about them. I kid you not MORE THAN ONCE I’ve freaked out momentarily at the playground following my older child around because I couldn’t remember where I put the baby. The baby was on me. I was wearing the baby. 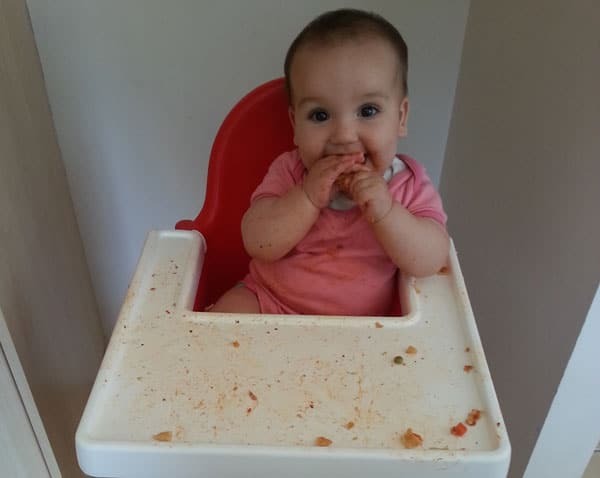 Baby-led Weaning means instead of making up your baby a whole lot of food specifically for them – or buying expensive jars of puree baby food – you just feed them whatever you have on your plate that’s appropriate for them to eat. For the first year of my daughter’s life I barely even put food in a bowl for her – I just chucked scraps on her high-chair tray. 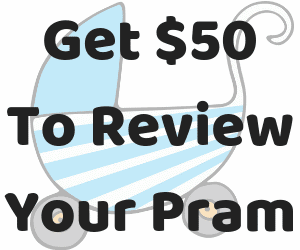 Cosleeping – your baby doesn’t even have their own bedroom! Some don’t even have their own bed!!! Following the theme? Attachment Parenting or “baby/child led” parenting doesn’t mean staring at your baby waiting for them to express a need – it’s getting on with life and responding to their needs as they arise. Myth 7. Attachment Parenting is a silly label, because it’s just normal parenting. I love when people say this. Love it! Because it means they’ve not experienced pressure or the normalising of “detached” parenting. I found Attachment Parenting when my first was a baby because I was under enormous pressure to “stretch out” feeds (Refuse to feed my son when he was hungry) let him “self settle” (Cry himself to sleep) or teach him to “be independant” (Put him down when he wanted to be held). Responding to your baby’s needs IS the most natural and normal approach to parenting, it’s just that there is a lot of pressure to separate parents from their babies and to ignore babies when they are clearly communicating that their needs aren’t being met. This is incredibly sad for all involved. But I think it would be nice if one day there’s no need for “Attachment Parenting” at all, because it is just “Parenting”. From one attachment parent to another, I hear you! Especially on the boundaries point! My absokuteky have boundaries!